Schwannoma is a tumor which is benign in nature which arises from Schwann cells. Schwannoma may present with symptoms and signs such as headache, nausea, vomiting and seizures as well as raised intracranial pressure tinnitus, ipsilateral loss of hearing and vertigo due to compression of the cranial nerve VIII by the schwannoma. Schwannoma is presented with two form of growth pattern which are known as Antoni A and Antoni B. Antoni A is a tightly packed elongated cells with palisading nuclei. Antoni B is loosely arranged cells and microcysts. 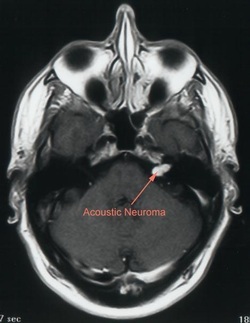 Neurofibromatosis type 2 is associated with bliateral acoustic schwannoma due to compression of the cranial nerve VIII. Pathological studies may reveal that schwannoma may present as encapsulated mass that present in the cerebellopontine angle . There are cystic areas associated with Schwannoma. Schwannoma need to be resected if it is need to be treated. 1.Lunardi, P., P. Missori, L. Mastronardi, and A. Fortuna. “Cystic Acoustic Schwannomas.” Acta Neurochirurgica 110, no. 3–4 (September 1, 1991): 120–123. doi:10.1007/BF01400678. 2.Chandler, C L, and R T Ramsden. “Acoustic Schwannoma.” British Journal of Hospital Medicine 49, no. 5 (March 3, 1993): 335–343.